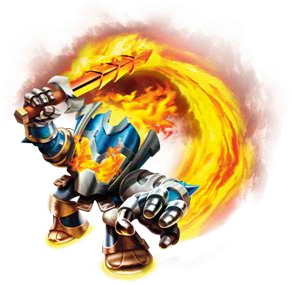 Place your first Skylander on the portal, the type doesn't matter but for the purposes of the walkthrough I would suggest a Giant. Tree Rex most likely. Smash through the grate in the wall to find the very first collectable of the game, a Winged Sapphire. These you may recognise from Spyro's Adventure, they give you a small discount on your upgrades, not that you can upgrade yet. Head left up the slope following the little goats, go around the corner and continue upwards past some debris that Eon will suggest you attack to clear. As a Giant you can also just walk straight through it and you'll smash it automatically. Go through the wooden fence blocking the path and onto a slightly more open area. To find a few coins you may want to pick up the large rock using a Giant, underneath is a bounce pad which will take you up to a small wooden platform above you. Drop back down and continue down to the right following the path of coins. Giants can't just smash everything, even they'll sometimes need help. The blockage here requires you to fire the cannon opposite. Push the turtle three or four times to get past, then push the next turtle all the way to the left off the side so you can use it to reach the Treasure Chest. Shake the chest open and return to the main path, push the remaining turtle off to the right to use it as a bridge too. Follow the path down onto some bamboo platforms and then further down to the ground where you'll see a Mabu being attacked by a gang of Bone Chompies. Attack them or, if you're a Giant, simply walk over them. The littlest enemies you can just squish. Once you've saved Norticus head inside the cave. Catch up with Norticus and then use a Giant to pick up one of the two boulders to the left, throw it anywhere you like and go up the ramp on the other side to pick up Shroomboom's Soul Gem "Self-Slingshot". Drop off and follow Gigantus past the boulder he picked up, ignore the Giant Jump for the moment, first head down the slope and in the corner on the right is a boulder blocking your path to the second Treasure Chest. Continue on down to the bottom and smash through the wooden fence to pick up the Story Scroll. Walk all the way back up to the Giant Jump spot and smash through the floor below. As a Giant you will find the third Treasure Chest, a normal Skylander would drop down out of reach to the right. A normal Skylander can still continue, you just need to drop through the hole that Gigantus made. Enter the Chompy Pit. Once you've killed the 20 Bone Chompies that appear an Arkeyan Jouster will jump down and attack, avoid his overhead swing attack as you kill him. Once he's defeated the Monster Gate will open. Use the bounce pad to get up to the first level, then again to a second. Instead of following the Bounce Pads left go to the right (as long as you have a Giant that is) and pick up the rock blocking the path. Jump down into the Chompy Pit again. Defeat another 20 Chompies to exit. Nothing special yet. Go up and around circle back around into the Chompy Pit for a third time, this time upon completion you will be rewarded with a Luck-O-Tron Wheel, this one's for Experience. You should also have reached the number of enemies killed for the Enemy Goal "Dare" as you only needed 40. Unfortunately you can't have another go in the Chompy Pit, if you circle round again nothing happens. Anyway, this time follow the Bounce Pads to the left up to Norticus. Before you exit the cave go to the left where there's a Mabu called Rizzopolus standing next to a section marked with a Life Element marker. You might have guessed but you need to be a Life Element Skylander to go through, luckily Tree Rex is such an element so this one you should be able to do no matter which pack of the game you bought. Remember that you can also use your Skylanders from Spyro's Adventure, they too can unlock the elemental areas. One odd new feature of the elemental areas is that if you keep the matching element Skylander active you'll restore 5 health every few seconds, perhaps useful if you happen to have a low health matching Skylander. Push through the turtle and you'll be introduced to a Root Runner. Similar to the Chompy Pods of Spyro's Adventure these things spit out Chompies, there is one major difference but not one that you can see here. Unless you have a Skylander with a long ranged attack you may not be able to kill it, if not then just ignore it and push the turtle back to where it was. Go up the ramp on the left side and cross over the turtle to get to the Present. Inside the Present is a Flower Fairy Hat, this gives you a small movement speed boost if you put it on. Leave the cave and you'll be shown the Conquertron, Norticus will ask you to destroy some chains to defeat it. Over to the left however is an air element area, if you got the Starter Pack you'll have Jet-Vac. If not and you don't have any other Air Element Skylanders then just carry on to the right. The fourth and final Treasure Chest is right below the entrance, shake it open and then bounce up on the Bounce Pad. Going left you'll see some jets of steam rotating around, these are harmful so don't go walking into them if you're low on health. Instead follow them around anti-clockwise and drop down the left side where you'll find the Present and your brand new Turban, this hat gives you a small amount of extra armor. Use the Bounce Pad on the right to leave the area. Go towards the first chain that the giant robot is attached to, you can either attack it or use a Giant to pick up the stake holding it in place. The gate to the right will open, walk down the wooden path squishing a couple of Bone Chompies along the way, push the two blocks out of the way and approach a bamboo platform section with two Arkeyan Jousters to defeat, killing them will cause a Bounce Pad to appear over where there's a purple crossed swords icon on the floor. Ignore the pad for the moment and go the left in the corner of the bamboo platform, you'll see some Mabu up on a platform. Go around that platform to meet Rizzopolus again and find an Undead area (the Series 2 Cynder in the Starter Pack is of course perfect here). Walk left down the slope and through some spikes to the Present with the Paper Fast Food Hat inside. Just a small area this one, turn around and head back out again. Use the Bounce Pad and go up the bamboo platforms to the right. The Conquertron will smash down a section of it that will let you past. Instead of going for the chain, first go to the bottom right corner and drop off the side behind some barrels, you'll find the level's Legendary Treasure down there. Bounce back up and then take care of the chain. Proceed onwards to a Monster Gate with a few Bone Chompies and three Arkeyan Jousters to defeat, after that it's the final chain. Watch out for his laser attack, after a bit he'll clear the chain of some rocks and allow you to break it and finish the level. The game will now award you with your star rating, hopefully if you've followed the walkthrough you should have two of them, with only the time limit "Dare" remaining (unless you're super fast!). To attempt to get that you just select the level on the Chapter Select and rush through ignoring all the side stuff like the Elemental Areas. Skipping text is not necessary (although you'll probably want to) as the counter pauses during conversations. Balah Boo. That means "Fourth game after Swap Force where Kaos isn't the bad guy. But his mom, who appeared at the end of giants in a cutscene, is the bad guy. GET IT???!!! i used for the time. i am posting this at this at this point is because it applies for the whole game. I have almost everything in the game except a few hats. this guide really helped me out for the main portion of the game, but I dont get how to get the last 4 LEVELS!!! Prism Break 4 the win!!! Wow I got all objectives exept time without this! Yeah, Dark is just not showing the real things because dark does`nt exactly know what it looks like.